I don’t have a recipe card for this one because it was told to me as an anecdote. An old boyfriend was descended from some Sooners. His father’s people had come across the country in a covered wagon, and one of the recipes they brought with them was for Dutch Honey. This recipe was handed down through the generations, and by the time I met Vera Pharis she was in her 70s, and the recipe had morphed, certainly. The way it goes is that you take a cup of cream, a cup of sugar and a cup of white Karo. 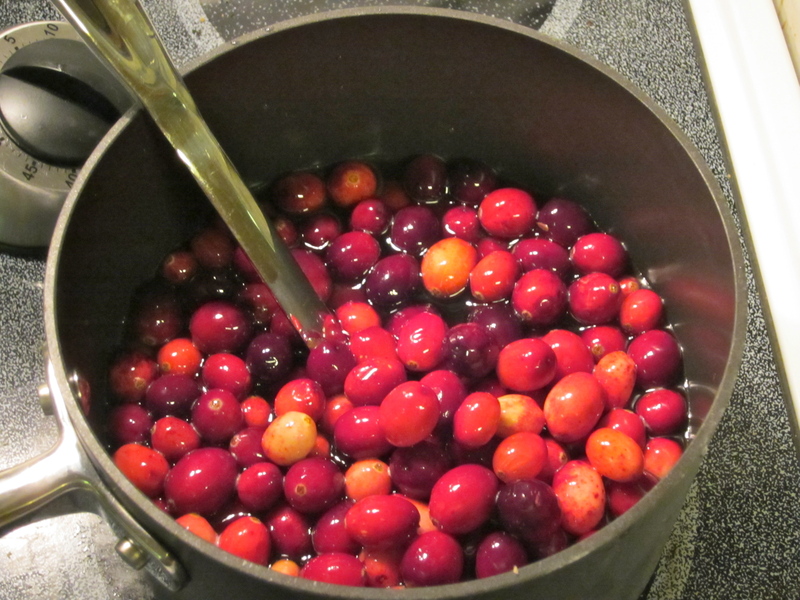 Combine them in a pot and cook them slowly, stirring constantly, until just below soft ball. You can tell it’s done if the syrup on the spoon is slow to roll over the back of the bowl of the spoon. But, don’t cook it too long because it will turn to caramel! The original recipe was probably made with molasses, and one day I’ll likely try that. Dutch Honey should be refrigerated. Tonight, however, I stuck with the original recipe as the tried and true. 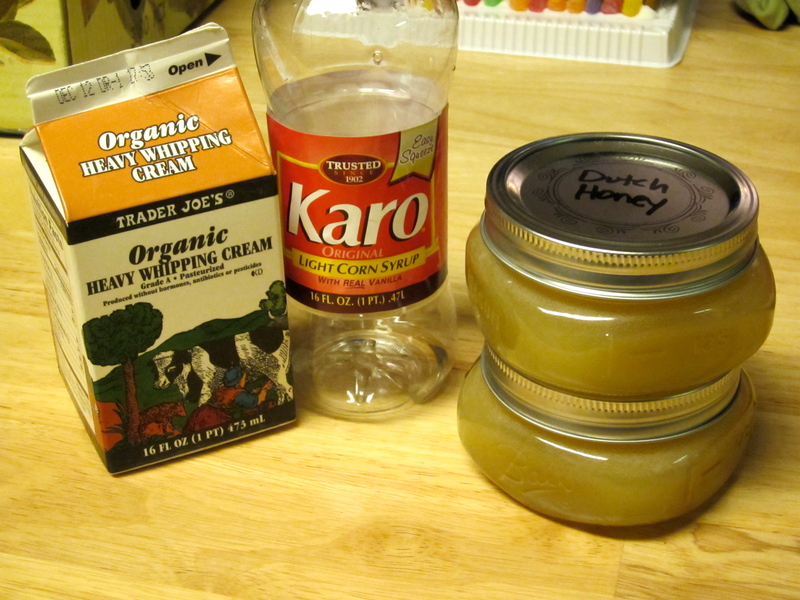 I made holiday gifts for some friends, and Dutch Honey was one third of the offering. 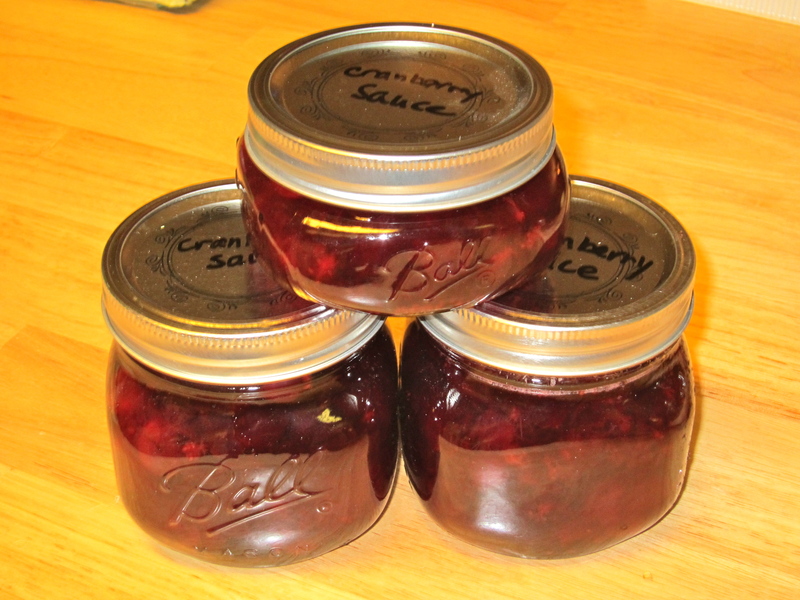 I also made cranberry sauce from Gram’s recipe, and Cousin Anne’s pepper sauce. I just love making things for my friends! First stir together 1 cup sugar and 2 tablespoons water until the sugar dissolves. Let it boil without stirring until the sugar carmelizes (about 5-10 minutes). It will be a light brown color. Then add 1 cup cream and 1 cup Karo syrup. The carmelizing of the sugar gives it the distinctive taste. Hi Arch – your method is probably correct. It has been a long time since I learned this from your mom and we never actually did it together for some reason. Thanks for the update!